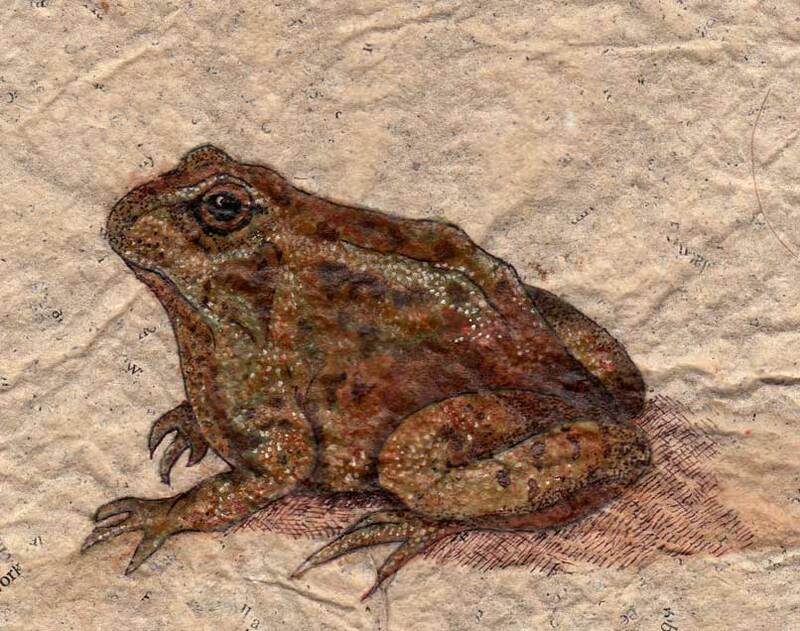 Frog painting on handmade paper recycled from a Jeffrey Archer novel. Placed the pond in the garden this lunch time. I say pond, it’s more of a plant pot, round and flat and plastic. But I read in an article somewhere that any pond, no matter how small, is good for helping frogs and toads. As I mentioned in my bones blog amphibians are becoming extinct rapidly, due to pollution, loss of habitat and the devastating effects of a fungus that grows on the frogs skin preventing it from being able to breath – http://www.amphibianark.org/. Frogs are going extinct! I repeat this because my head has trouble taking it in – no more frogs! Whole childhoods absent of frogs. Sounds (have a listen) that were ancient by the time the first dinosaurs evolved are now to be silenced. I can’t imagine a childhood without frogs, they were a defining feature of mine; water coming over the tops of wellingtons as we waded knee deep at Footscray meadows in search of frog spawn; Mum digging the pond; me refusing to believe that tadpoles turned into frogs (well it is weird). Then the huge plague of minute baby frogs covering the lawn, the whole garden leaping about, Mum’s lawn mower chopping them up into tiny pieces (accidently), frog blood and guts everywhere. Then the dissections. We didn’t catch the frogs ourselves, didn’t need to, our cat was fond of delivering half dead frogs to the kitchen floor. Dad, trained in anatomy and medicine, would whisk the frog from the floor and place it on the kitchen table. Us four excited children would gather round the table in anticipation as Dad went to get his scalpel. A moment of heavy silence passed before the first incision. The skin would split and the creature would deflate like a tiny green beach ball. Dad fished around the inside, taking out bits to show us, explaining what did what. There was a tiny little bubble inside the frog that facsinated me, I played with it turning it over and over, can’t remember what it was though. My memories of the intellectual aspects of these dissections are vague, for a 12 year old the grotesque splendour of frog body fluids and bone on the kitchen table was too delightful to be educational. “Right!” Mum would shout in an authorative manner, “clear the table its time for dinner”. Dad would sweep away the frog remains, leaving them outside for our dog to contemplate. We’d reluctantly go off to wash our hands for dinner, somehow feeling more grown up because we knew what the insides of a frog looked like. A childhood without frogs? Real riggling, leaping, croaking frogs? Without watching tadpoles grow legs? Just computer frogs with no body fluids, no mess, no temptation for the cat and Dad? Now that would be cruel to children. Previous Post A large rat, a missing cat and a Wednesday night Against Nature. Really really sad and almost unbelievable – a fungus you say? so anything to do apart fro puttin plant posts in the garden? I never washed my hands. There is always dead pigeons.